My friend Linda might as well be my sister. We have been friends since we could walk and lived one house away from each other growing up. 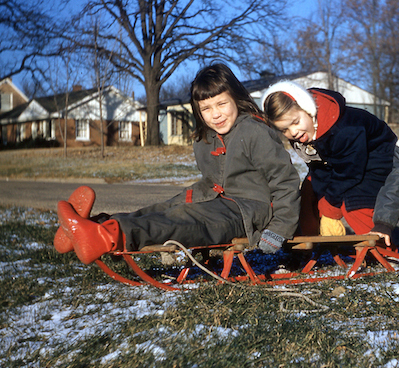 We shared a love of peanut butter and potato chip sandwiches, Barbie dolls, Ken the Good Humor Man, playing in my backyard playhouse built by my grandfather, and our mom’s cooking. We were always eating at each other’s houses, usually because we were having too much fun playing and didn’t want to separate. We both had great moms who were also friends and they used to swap recipes. 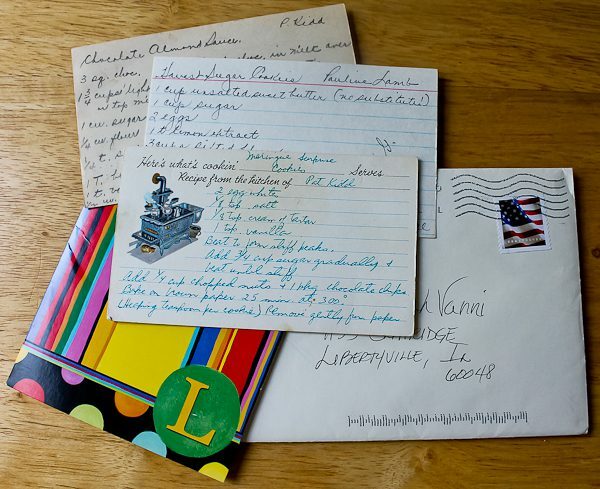 About a week after the flood that destroyed my cookbooks and recipes, I received a letter from Linda. Enclosed were three recipes that Linda said she had found in her mother’s recipe box. There were two of my mother’s and one of my grandmother’s. She also told me a story I didn’t know, that her mother-in-law lost 90% of her belongings in a devastating Nashville flood in 2010. 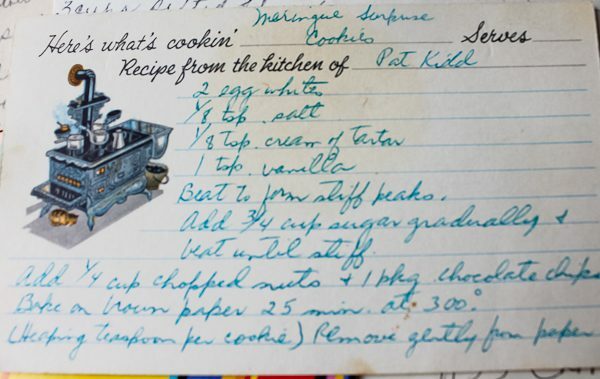 Linda understood the losses involved in a flood and knew these recipes would be precious to me. She was so right. The recipe I remember the most is my mom’s “Meringue Surprise Cookies.” The surprise is chocolate chips inside. Lots of memories in those simple cookies. I love how she used to line a cookie sheet in brown paper, meaning a cut apart grocery bag. That was the days before parchment paper! I can still see those cookies sitting on the crinkled up brown paper as they came out of the oven. Then last night something else happened. Sometimes when Linda and I used to call each other, even into adulthood, we would both say, “I was just thinking about you!” Funny how that happens, but I think it does when you have such a strong bond with someone. With my own girls, I will have my phone in hand ready to call one of them and it rings – and it’s one of the girls. So last night I was looking at the recipes again and decided I would make the meringue surprise cookies sometime soon. It was getting late so I did what I always do every night – go check the front door to make sure it’s locked before heading upstairs. I opened the door to see what the night air felt like and there was a package on the front porch. It must have been there since late afternoon. It was from Linda. I knew this was going to be special. And that’s exactly what I plan to do and what the new Cellar is all about. I think Linda knows me pretty well. 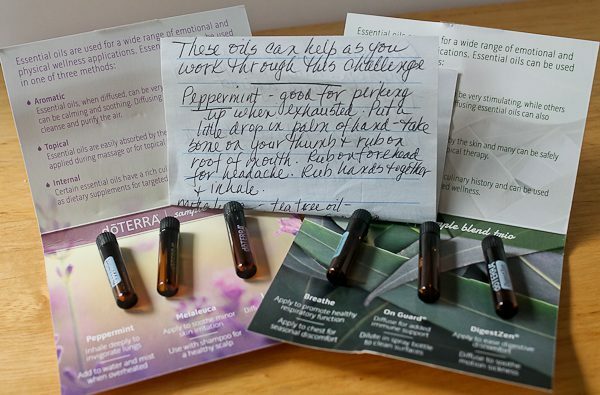 Linda also enclosed some lovely oils because she’s a comforter and caregiver like her own mom. She gave an explanation what each oil does for the body and helps get through challenges. Sounds good to me! And the books! 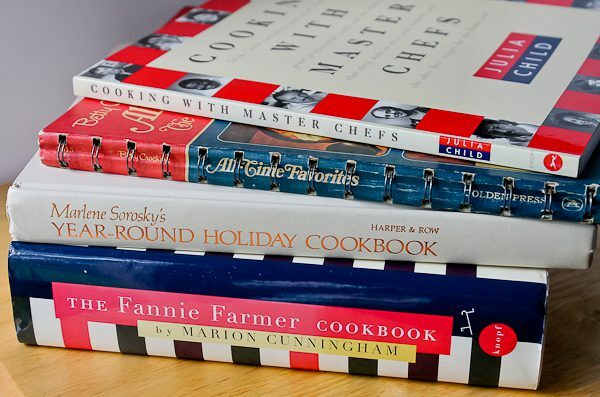 Couldn’t have been more perfect: Another Julia, which makes three different ones I have received now; a vintage Betty Crocker; the revised Fannie Farmer from the Grandmother’s original version; and The Year-Round Holiday Cookbook, probably one of my all-time favorites. I had made almost every recipe in that book over the years and I can’t begin to say how excited I am to have it. It’s like Linda knew all that I needed: a Julia, a Betty Crocker, a revised classic, and an all-time favorite. Thank you, Linda, for these treasures and memories but mostly I am thankful for you in my life. It would never have been the same without you. Yes, thankful and grateful for sure. And for the Lisa’s too! I really appreciate your Culinary Cellar blog! I too really enjoy cookbooks! I’d had to weed out a number of my cookbooks before I moved to my retirement community, but then I’ve gone back to buying/ordering cookbooks-basically from Taste of Home. As for friends, I’ve had a number of friends who enjoyed cooking and baking-one friend had passed away in 2007! She has given me a number of cookbooks which I’ve kept and one of the cookbooks has been used a LOT, judging by the stains on the pages and my colored page tags! My friend’s name was Sharon. Us 2 had a real common bond and I really enjoyed chatting with her about her recipes and what she’d prepare! I’ve also had handwritten recipes from Sharon! Thank you, Dawn! I’m so happy you enjoy reading the blog and are a fellow cookbook enthusiast! I loved hearing about your friend Sharon, who gave you the cookbook with all the stains on the pages. Aren’t those the best? It’s what I always look for when I buy used books at sales because I know there was a good recipe on that page! Even better than that are the handwritten ones. How lucky you are to have had a friend like Sharon who trusted you with her cookbooks and now her legacy will live on through you. The cookbook was brand new from Sharon and I was the one responsible for the stains on the pages, LOL! That means it’s a very loved book! It sure is and I still use this book! What a wonderful friend you have in Linda! It’s a delight to read about all of the treasures you have received and you are continually receiving! I’m looking forward to seeing what you write about next!!!!!! Thanks, Ronna. Linda is beyond wonderful! I’m so happy you are enjoying the blogs. You and your books will be a subject soon! Watch for it. I have so many blogs to write about all the amazing people sending me books, I am thinking about doing a daily blog as best I can just to keep up! These are so fun to write. The wonderful bond of ‘besties’! And I think our generation grew up in the ‘golden age’ when life was simpler (and less expensive! ), and lifelong friendships were made face to face while enjoying the adventures of life together. Thanks for sharing your friend Linda with us. Kim, it’s so true how different is was when someone was right next door. Don’t we all wish our friends were all in one spot! I wish you and I were not so far apart, that’s for sure! Wish we lived closer, too. But thankful for technology/social media which has helped us stay close and in touch after meeting 30 years ago when we won the Philly Hall of Fame recipe contest. Do you know it was the summer of 1987 that we meet in San Francisco. Thankful for your sweet friendship over all these years and over all the miles. Isn’t it crazy to think it was that long ago? My girls were little and yours weren’t even born yet! That contest was one of the best ever for so many reasons, mainly because we met there, and remain friends to this day! I miss you all the time. Love this! I am so happy I found your blog. I’m happy you did too, Anita! Thank you so much for reading it.